Pakistan science club conducted innovative scientific projects workshop at Government Girls Secondary School Intelligence Sultanabad summer camp, this summer camp was organized by Teach for Pakistan (an initiative of the Aman Foundation based in Karachi). The students of class 6th, 7th, 8th and 9th took an active part in that workshop and were mainly divided into two main groups. Both the groups were comprised of almost 50-60 students and were further divided into 10 teams of 5-6 students. Each group worked on 10 different projects and two competitions in two days. The camp for 1st group was organized at 26th and 29th of June and for the 2nd group was at 5th and 12th of July. 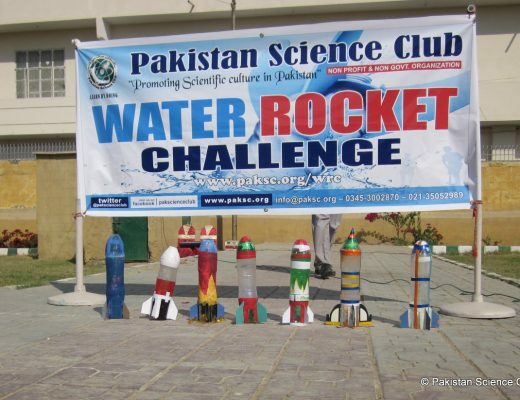 The projects for the 1st group on the first day were enlisted as:-Water rocket, Potato battery, Coin battery, Light sensor, Periscope and Building bridge competition. Two groups worked on the same project separately and after that all the teams were provided with Popsicle sticks and super glue for building bridge competition in the time limit of 45 minutes and according to the rules described in the presentation for the competition. The winner was decided on the basis of highest scoring points gained in structural design, efficiency, neatness and innovation they used. For 29th of June (second day), the projects were, Solar cooker, Telescope, Hand power generator, Vertical wind turbine, Electromagnet and Egg dropping competition. In egg dropping competition rules were specified in the presentation, the team that succeeded to save the egg from breaking while dropped at a certain height was announced as the winner. The main purpose of organizing such activities was to teach the students that how the things really work. What is the science behind them in a very interesting and proper way. The science is not only what we have studied and what are we studying in books but it is something beyond books. It is all about practical doing and it is the best way to understand it. Next A Student from Vehari’s Mailsi Village’s represent Pakistan Intel Arizona.